If you are going through the town of Garibaldi on a nice day and want to stretch your legs walking the long Piers End pier is a great way to enjoy some fresh air and get a unique view of the Tillamook Bay. 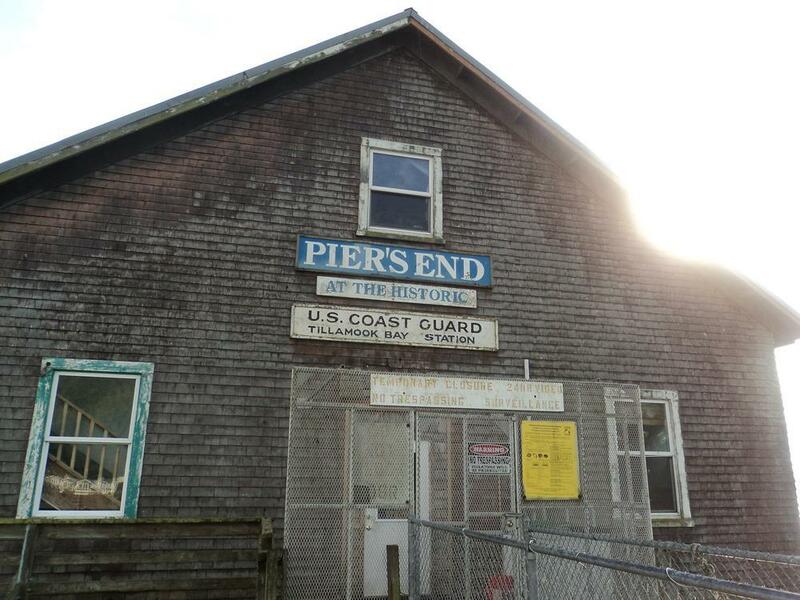 Located right across the street from the Historical Coast Guard Headquarters on Garibaldi which was constructed in 1911 and is listed on the National Register of historical locations in the US. The pier while having a large building at the end that used to be the former Coast Guard Rescue station which is now closer to the Marina areas is currently closed. It used to be open a long time ago with a small shop however there is no going past the gated fence as it is locked. The pier is equipped for a place to spend an afternoon crabbing for Dungeness Crab with several turn out locations that are designed for setting up with a couple of chairs to hang out while soaking a few crab pots. Crabbing tends to be good during the fall and into the winter. You will have to bring your own bait from home or buy at the local stores before you arrive to the pier. There is a handful of turn out locations and depending on the water level any of them can be good to try and crab from. The Port of Garibaldi has recently set up some new rules for crabbing at Piers End which include the pier only open from dawn to dusk, no cutting bait on the pier, no crabbing from the fence only from the turn out locations, and no leaving a pot unattended, so you can not place a crab trap and come back in a few hours to pull in your catch. During a low tide there is also clams available in the sandy areas below the stairs down to the water. Location of Garibaldi Piers End – Take 12th st from the 101 and then make a left on Bay Lane. There is some parking area near the entrance for the pier. There is plenty of parking available.